For the fictional character in Devdas, see Chandramukhi (character). For the 1995 Hindi film, see Chandra Mukhi. Chandramukhi (English: Moon-faced beauty) is a 2005 Indian Tamil-language comedy horror film written and directed by P. Vasu, and was produced and distributed by Ramkumar Ganesan of Sivaji Productions. The film features Rajinikanth, Prabhu, Jyothika and Nayantara leading an ensemble cast that includes Vadivelu, Nassar, Sheela, Vijayakumar, Vinaya Prasad, Sonu Sood, Vineeth, Malavika and K. R. Vijaya. It is a remake of Vasu's Kannada film Apthamitra (2004), which itself is a remake of the Malayalam film Manichitrathazhu (1993). The soundtrack album and background score were composed by Vidyasagar. Cinematography was handled by Sekhar V. Joseph and editing was done by Suresh Urs. Chandramukhi's plot revolves around a woman who suffers from dissociative identity disorder that affects a family, and a psychiatrist who intends to solve the case while risking his life. The film was made on a budget of ₹ 190 million. Principal photography began on 24 October 2004 and was completed in March 2005. It was released on 14 April 2005 on the eve of the Tamil New Year. The film received positive reviews and was a major box office success. It was the longest running South Indian film, with a theatrical run of 890 days, until its record was overtaken by the Telugu film Magadheera (2009) which completed a theatrical run of 1000 days. The film won five Tamil Nadu State Film Awards, four Film Fans' Association Awards and two Filmfare Awards. Jyothika and Vadivelu were each awarded a Kalaimamani Award for their work on the film. Chandramukhi was dubbed in Telugu and was simultaneously released with the same title as the Tamil version. It was also dubbed and released in Bhojpuri under the title Chandramukhi Ke Hunkaar. It became the first Tamil film to be dubbed into German. It was released in Germany under the title Der Geisterjäger (English: The Ghost Hunters). The film was also dubbed into Turkish. Chandramukhi was dubbed in Hindi and released on 29 February 2008 by Dilip Dhanwani, owner of the production house Royal Film Company. The Hindi version was released in collaboration with producer A. M. Rathnam. Saravanan, a psychiatrist, meets up with his foster brother Senthilnathan alias Senthil, and his wife Ganga while on vacation. Senthil's mother Kasthuri wanted Senthil to marry Priya, the daughter of his father's cousin Kandaswamy, to reunite the two branches of the family after 30 years of separation because Senthil's father chose to marry Kasthuri instead of Kandaswamy's sister, Akhilandeshwari. Saravanan learns that Senthil had bought the Vettaiyapuram mansion, despite attempts by the local village elders to dissuade them, and moves in with them. Akhilandeshwari is jealous of Saravanan and plots to kill him with the help of her assistant Oomaiyan. When the family visits their ancestral temple, the chief priest reveals the reason everyone fears the mansion. A hundred-and-fifty years ago, a king named Vettaiyan travelled to Vijayanagaram in Andhra Pradesh, where he met and fell in love with a dancer named Chandramukhi. However, she did not reciprocate his feelings as she was already in love with a dancer named Gunashekaran. As a result, Vettaiyan took her back to his palace by force. Unknown to him, Chandramukhi made Gunashekaran stay in a house nearby and had meetings with him secretly. When Vettaiyan discovered this, he beheaded Gunashekaran on Durgashtami and burnt Chandramukhi alive. As a result, Chandramukhi's ghost tried to take revenge on Vettaiyan, who with the help of various priests and sorcerers from all over the country, tames the ghost by locking it up in a room located in the palace's south-west corner. Priya is in love with Vishwanathan, a dance professor who reciprocates her feelings. Their love is supported by Saravanan, who requests Kandaswamy to arrange their marriage. After hearing Chandramukhi's story, Ganga, who thinks that the story was fabricated to scare thieves from stealing treasures in the room, wishes to go there. She gets the room key from the gardener's granddaughter Durga and opens the door to the room. Saravanan sees a conversation between Durga and Ganga, and runs away, thinking that Durga is possessed, because a flash of light appeared when both of them were speaking. Subsequently, strange things begin to happen in the household; a ghost frightens the people in the house, things inexplicably break, and Ganga's sari catches fire. Suspicion turns towards Durga. Senthil immediately calls Saravanan to solve the case. As soon as Saravanan returns, a mysterious being tries to kill Priya. Saravanan also investigates other incidents such as the attempts to kill Senthil are made with poisoning his coffee and by pushing a fish tank on top of him, and a mysterious voice singing during the night. Ganga mysteriously disappears during Priya and Viswanathan's wedding reception. Saravanan notices her absence and searches for her, but he is almost killed by Oomaiyan—who has been sent by Akhilandeshwari. Saravanan subdues Oomaiyan and with Senthil's help finds Ganga, who is supposedly being sexually harassed by Viswanathan. Saravanan reveals to Senthil and Viswanathan that Ganga suffers from split personality disorder. Saravanan tells them that Ganga tried to kill Priya and Senthil, and framed Viswanathan for sexual harassment because from Chandramukhi's view, Viswanathan is her lover Gunashekaran since he stays at the same place Gunashekaran did. By framing Vishwanathan, Chandramukhi wanted to stop the reception. The only way to stop Chandramukhi is to make her believe she killed Vettaiyan on Durgashtami since Saravanan impersonated Vettaiyan and disrupted one of the pujas conducted by the exorcist Ramachandra Acharya by conversing with the ghost to know its wish. Akhilandeshwari overhears Saravanan's idea of self-sacrifice and apologises to him. On Durgashtami, in the dance hall, the family and Ramachandra Acharya allow Chandramukhi to burn Saravanan alive. Ramachandra Acharya blows smoke and ash on Ganga's face when she is given a torch to burn Saravanan. Senthil then opens a trapdoor to let Saravanan escape, and an effigy of Vettaiyan gets burnt instead. Convinced that Vettaiyan is dead, Chandramukhi leaves Ganga's body, curing her. The two families are reunited after 30 years, Saravanan and Durga fall in love, and the couple Swarna and Murugesan become parents after eight years of marriage. Director P. Vasu, producer Ramkumar Ganesan and Raj Bahaddur make guest appearances in the song "Devuda Devuda". Four weeks ago, [Rajinikanth] called me on a Sunday afternoon, and asked what I was doing. I told him I had had [sic] a lot of biryani and was spending time with my sons! He laughed in his stylish way, and then asked if I was doing any new production. I told him we are thinking of doing a Hindi film with Rajkumar Santoshi in March. We are also doing a Telugu serial which my cousins are looking after. I was quite free at the time. That's when he asked me, 'Shall we do a film, Ramu?' It came as a pleasant surprise. On a Sunday afternoon, after a heavy lunch, this suggestion from Rajnikanth was like superb dessert! I said, 'I am very happy sir.' He told me he had heard a subject, and we would make a film on that. Chandramukhi was the 50th film produced by Sivaji Productions. During the success meet of Mannan (1992), Rajinikanth announced that he would act in Sivaji Productions' 50th film. In September 2004, Rajinikanth congratulated P. Vasu on the success of his Kannada film Apthamitra (2004) and was impressed with the film's screenplay. Vasu then requested to remake the film in Tamil with Rajinikanth, who in turn, called Ramkumar Ganesan and asked him to produce it under Ramkumar's banner, Sivaji Productions. Ramkumar telephoned Vasu, who was offering worship in a temple in Guruvayoor at that time, informing him of Rajinikanth's wish to do Apthamitra in Tamil under his direction. Vasu reworked the script he wrote for Apthamitra to suit Rajinikanth's style of acting. The film dealt mainly with the concept of dissociative identity disorder, commonly known as "multiple personality disorder" (MPD) or "split personality disorder". Another film titled Anniyan (2005), which featured Vikram in the lead role, and was released two months after Chandramukhi, was also based on the same disorder. Thota Tharani was the film's art director, and also designed the costumes used in the film. Regarding the designing of the Vettaiyapuram palace, he watched both Apthamitra and its source Malayalam film Manichitrathazhu (1993) to get the basic idea of the film's plot. Vasu wanted Tharani to make the sets more colourful and grand and did not want the realistic look of the original film. Tharani designed Chandramukhi's room and placed a corridor in it, which was quite different from the original and its Kannada remake. The corridor resembled those commonly seen in palaces in Kerala. Sidney Sladen did additional costume designing in the film. Rajinikanth played the roles of Dr. Saravanan and King Vettaiyan. He sported a wig for his role. Both Rajinikanth and P. Vasu discussed every scene featuring the former and added necessary inputs before they were shot. Rajinikanth appears in the beginning of the film unlike Manichitrathazhu, where the same character, played by Mohanlal, appears in the middle of the film. Rajinikanth requested Vasu to change the dancer's name from Nagavalli, which was the name of the danseuse in Apthamithra, to Chandramukhi since the latter sounded more royal. While Vishnuvardhan uttered "Haula Haula" in the original, Rajinikanth used "Lakka Lakka", which was based on the mannerisms of a villain in a Marathi play Rajinikanth watched in his childhood days. Ramkumar's brother Prabhu played Senthilnathan, a civil engineer and owner of Ganesh Constructions. Prabhu co-produced the film with Ramkumar. For the roles of Ganga and Chandramukhi, Soundarya was initially selected to reprise her role from Apthamithra, but her death led the director to choose Simran and he shaped the character to suit her. In November 2004, Simran refused to do the project, as her role required a lot of dancing and cited her pregnancy at that time as another main reason for her refusal. Aishwarya Rai was offered the role but she declined the offer due to schedule conflicts. Sadha and Reemma Sen were also considered as replacements. The role finally went to Jyothika, who gave 50 days of her schedule for the film. 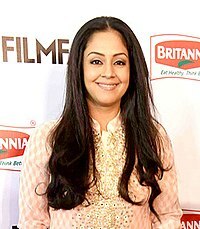 Vasu wanted Jyothika to perform her scenes in a manner different from that of Shobana's role in Manichitrathazhu, enacting the scenes himself before they were shot featuring Jyothika. Nayantara was selected to portray Rajinikanth's love interest, Durga, after Vasu was impressed with her performance in her debut film Manassinakkare (2003). Vadivelu portrayed the comic role of Murugesan, Akhilandeswari's and Kandaswamy's younger brother. Rajinikanth, at the film's 200th day theatrical run celebration function, said that it was he who recommended Vadivelu to Vasu for the role and had asked Ramkumar Ganesan to get Vadivelu's dates before planning the filming schedules. Nassar played Kandaswamy, Murugesan's older brother. Sheela, who was known for her role in the Malayalam film, Chemmeen (1965), played Akhilandeswari, the intimidating older sister of Kandaswamy and Murugesan. When Sheela was signed on for the role, she was requested by the producers not to divulge details about her role to the media. The amphitheatre in Hierapolis where "Konjam Neram" was shot. Principal photography commenced on 24 October 2004 with a puja ceremony for the muhurat shot at Annai Illam, the residence of Sivaji Ganesan. Ramkumar Ganesan said the filming would be finished by 15 February 2005, giving the crew two months to complete the post-production work, including visual effects. The first shooting schedule began two days later with a fight scene choreographed by Thalapathy Dinesh and filmed at Ramavaram in Chennai. More than 25 Toyota Qualis and 30 stunt artists were involved in the fight sequence that featured Rajinikanth. The Vettaiyapuram mansion was erected in Hyderabad. The song sequences, one picturised on Rajini alone, two songs in which he appears with the other principal cast members, and the climax song, which was picturised on Jyothika, were filmed in Ramoji Film City. Vasu said the film had taken only 78 days to be completed instead of the planned 120 days. The picturisation of the song "Devuda Devuda" focused on a variety of professions, especially janitors, sewage cleaners, farmers and washer folk. According to Ramji, who helped the production unit look for locations for the song "Konjam Neram", Australia and Russia were the initial choices for filming locations for the song sequence, but Ramkumar Ganesan and Vasu chose Turkey, making Chandramukhi the first Tamil film to be shot there. The production unit flew to Istanbul from Chennai via Dubai on 25 February 2005. The filming of the song was completed after the audio launch. "Konjam Neram" was shot in segments in Ephesus and Pamukkale. Shooting in Ephesus took six hours. The segment in Pamukkale was filmed in an amphitheatre in the ancient city of Hierapolis, which is located close to Pamukkale. The last segment was shot in the Cappadoccia region, a 10-hour drive by bus from Istanbul. "Raa Raa" was choreographed by Kala and took four days to be completed instead of the planned seven days. Vidyasagar composed the soundtrack album and the background score of Chandramukhi. The soundtrack album consists of six tracks. Vaali, Yugabharathi, Pa. Vijay, Na. Muthukumar and Bhuvana Chandra wrote the lyrics for the Tamil version. Bhuvanachandra, Suddala Ashok Teja, Vennelakanti and Vaali wrote the lyrics for the dubbed Telugu version. The track "Raa Raa" was based on the Surya raaga, which is also known as the Sallabham raaga. Asha Bhosle was engaged to sing a song for the film and to attend the film's audio launch. The audio rights for the film were sold to Sanjay Wadhwa of AnAK audio for ₹ 11 million. [a] Tata Indicom and Sunfeast Biscuits were the sponsors for the audio launch and marketing. The album was released on 5 March 2005 at the Taj Connemara hotel in Chennai. An overseas audio launch took place the next day in Malaysia. At the Music World shop in Chennai, 437 cassettes and 227 compact discs were sold on the first day of its stock release. The cassettes were priced at ₹ 45 each and CD's at ₹ 99 each. [a] The original soundtrack of the film and a video CD titled "The making of Chandramukhi", were released on 27 September 2005 in Chennai. The film's background score was released as a separate album. The album received positive reviews from critics. Siddhu Warrier of Rediff said that "Devuda Devuda" "finds S. P. Balasubramanian in top form". He called "Konjam Neram" "melodious in a forgettable kind of way", "Athinthom" a "soft, melodious song", "Kokku Para Para" as "insipid", "Raa Raa" "a rather listenable track", and said "Annonda Pattu" is "vintage Rajni, and gets your feet tapping. One can almost picture Rajni brandishing his trademark cigarette and sunglasses as he gyrates to the beat. If one is a die-hard Rajni fan, then one is likely to go beserk dancing to this." Singer Charulatha Mani, writing for The Hindu called the song "Konjam Neram", which was based on the Sriranjani raga, an "attractive take on the raga" and said the song "is contemporary in feel and traditional at the roots". The film was released on 14 April 2005, a Tamil New Year's Day release, alongside Kamal Haasan's Mumbai Xpress and Vijay's Sachein. Chandramukhi was released in 37 theatres in Malaysia, 15 in Europe, nine in Sri Lanka, seven in the United States, four each in Canada and the Persian Gulf countries and two each in Australia and Singapore. The film was released with 23 prints in Coimbatore, 12 more than Rajinikanth's Padayappa (1999). Chandramukhi was screened at the 18th Tokyo International Film Festival in Japan on 23 October 2005 and 28 October 2005 as part of the 'Winds of Asia' section. It was the first public screening of the film in Japan. It was met with positive response from audiences there. The film opened the 7th IIFA Awards Film Festival held at the Dubai International Convention Centre in Dubai, United Arab Emirates, becoming the first South Indian film to open the Film Festival. In November 2011, it was screened at the International Tamil Film Festival held in Uglich, Russia alongside Thillana Mohanambal (1968), Sivaji (2007), Angadi Theru (2010), Boss Engira Bhaskaran (2010), Thenmerku Paruvakaatru (2010) and Ko (2011). Though the film was a remake, Madhu Muttam, who wrote the story for Manichithrathazhu, was not mentioned in either the opening or closing credits. Instead, the story was credited to the director P. Vasu. Vasu defended himself by stating the script was not a scene-by-scene remake of the original and that only the basic plot was used. The film's original negative was damaged because of poor care and ill treatment. AP International started a restoration project, which scanned the film frame-by-frame in a 2K workflow. They were able to remove all wear and tear and retain the natural film grain. This restored version was released on 2 August 2012 on Blu-ray format. Jyothika (top) attracted positive reviews for her performance while Vadivelu (bottom) received praise for his performance in a comic role. The film received positive reviews from critics. Writing for The Hindu, Malathi Rangarajan said, "As you watch the film you cannot but admire the ingenuity of writer-director P. Vasu in choosing a story that is bound to sell and at the same time helping Rajini maintain his image of an invincible hero", before concluding that, "The 'Mannan' team proves a winner again". Another critic from The Hindu, Sudhish Kamath, said Rajinikanth is "at his vintage best". A reviewer from The Times of India called the film "Entertaining, stylish, respectful of ritual, and always massively larger than life". Arun Ram of India Today said, "With Chandramukhi, Rajnikant revives his fading career and fortunes of Tamil cinema". G. Ulaganathan, writing for the Deccan Herald praised the chemistry between Rajinikanth and Vadivelu, saying "Rajinikanth is back in full form, comedy comes naturally to him and he finds an able ally in Vadivelu. Some of the best scenes in the movie are when both are together." Tamil magazine Ananda Vikatan said in its review, "Rajni's films normally revolve around him but in this case, Rajni is in a script which goes around several people ... Rajni as Vettaiyan is the highlight of the film ... After many years, Rajni has shown that he does not confine to his personality cage through this film." and gave the film 40 marks out of 100. The Sify reviewer wrote that Chandramukhi was simply "a remake of P. Vasu’s Apthamitra from Kannada with some additional songs, fights and comedy scenes thrown in to further boost the superstar’s image" but like Ulaganathan, commended the comedy scenes of Rajinikanth and Vadivelu, terming them the film's highlight. A. Ganesh Nadar of Rediff said the film would become "a certain hit" and,"[t]he star will be happy, his fans will be happy and producer Prabhu will giggle all the way to the bank". V. Gangadhar of The Tribune wrote, "As in all Rajni films, Chandramukhi is a one-star attraction and Rajni plays to the gallery, There are no political messages in the film and that should come as some relief. With Nayan Tara and Jyotika in the female leads, there is plenty of glamour in the film. But the message is clear, King Rajni is back. His legion of fans can not ask for more." Karthiga Rukmanykanthan writing for Daily News Sri Lanka said, " ... the long anticipated delight Chandramukhi has made itself the box-office hit of the year". Grady Hendrix of Slate appreciated Rajinikanth's characterisation in the film, calling the character, Saravanan's ability to read minds "well-trained" before concluding, "Rajinikanth's movies are crammed with comedy, action, and musical numbers and they take great delight in kicking narrative logic in the face." Chandramukhi was a box office success, selling 20 million tickets worldwide and earning ₹ 150 million in salary and profit share for Rajinikanth. [a] The film's distributors made a 20 per cent profit over the ₹ 25 million[a] for which they bought the rights to the film. Its 365th day was celebrated at Shanthi theatre in Chennai; the celebrations were organised by Life Insurance Corporation of India. The film's 804th day celebration function was held at Kamaraj Arangam in Chennai on 25 June 2007. The then Chief Minister of Tamil Nadu, M. Karunanidhi, director K. Balachander, film producer and owner of AVM Productions M. Saravanan, Kamal Haasan and Sridevi attended the function. Karunanidhi presented the "Shivaji" sword to the film's cast and crew, and awards were given to everyone involved in the film. Chandramukhi grossed ₹ 8.4 million[a] in 11 days in eight screens in Chennai. In the Santham screen of Sathyam Cinemas, around 22,000 tickets were sold for the first 10 days of its release. The Telugu-dubbed version topped the box office charts in its first week of release. Chandramukhi grossed ₹ 30 million[a] in Coimbatore, beating the ₹ 24.5 million[a] record set there by Padayappa. Chandramukhi received ₹ 60 million as Minimum Guarantee (MG) from theatres in North Arcot, South Arcot and Chengalpattu districts collectively. It was also a hit in Kerala where it grossed ₹ 711,545[a] in four days, doing better than the Mohanlal starrer Chandrolsavam, which also released on 14 April 2005, but grossed ₹ 523,340[a] during the same period of time. The film's theatrical run lasted 890 days at Sivaji Ganesan's family-owned Shanthi theatre in Chennai, beating the 62-year record set by the 1944 film Haridas, which ran for 784 days at the Broadway theatre, also in Chennai. According to Krishna Gopalan of Business Today, the film grossed ₹ 750 million (US$16.6 million in 2005)[a] in its lifetime run. The New Indian Express estimates that it grossed ₹ 650 million (US$14.3 million in 2005). [a] This was the first Tamil film to exceed the box office record set by Ghilli (2004), which grossed ₹ 330 million (US$6.6 million in 2005). [a] It was the longest running South Indian film, until surpassed by the Telugu film Magadheera (2009), which completed a theatrical run of 1000 days in April 2012. Chandramukhi was screened in Tokyo in October 2005 to packed houses. Chandramukhi completed a 100-day theatrical run in South Africa. It collectively earned ₹ 43 million[a] in Malaysia, UAE and the US during the first month of its theatrical run. The film collected ₹ 62.78 million (US$1.4 million in 2005)[a] in Malaysia; it was the only Indian film to feature in that country's top ten grossing films of the year. I will forever remain indebted to composer Vidyasagar, who gave me the song when I was a nobody in playback singing. I had given a cassette of my songs to Vidyasagar, who knew Krishnakumar. [b] Then, about six months later, Vidyasagar invited me to record "Ra ra...". The way that song has helped me in my career—both as a playback and classical singer—has been incredible. I was lucky I got a song in a Rajnikanth film so early in my career and the Filmfare award for my very first song." In an interview with film journalist Sreedhar Pillai, Rajinikanth attributed the success of the film mainly to Vasu's script and the performance of his co-artistes. He said his comedy track with Vadivelu went a long way in making the film a successful venture and that it helped bring audiences to the theatres to watch the film more than once. He also said female viewers loved the portrayal of the female cast. Split personality disorder became well known after the film's release. MIOT hospital, in a blog description of the syndrome, called it The Chandramukhi syndrome. Film artist, trainer and film-maker L. Satyanand said Chandramukhi is a classic example of the subgenre "horror of the demonic" and of "brilliance", ranking it alongside The Legend of Sleepy Hollow and Psycho (1960). The film became a trendsetter for later horror films such as the Muni series, Yavarum Nalam (2009), Eeram (2009), Pizza (2012), Yaamirukka Bayamey (2014), Aranmanai (2014), Darling (2015) and Demonte Colony (2015). In a seminar on revisiting psychiatric disorders which centred around Chandramukhi and Anniyan, psychiatrist Asokan noted that there were many logical faults in both films. Responding to this, Vasu said that he did not know anything about psychiatric disorders: "I never had a brush with a ghost. Anyone watching films could come to a conclusion that ghosts have uniform--white saree and a pale face. My family saw the Malayalam film Manichitrathazu. Next day I saw a shadow moving in front of my bedroom and when I asked who was it, pat came the reply from my 4-year-old daughter that it was 'Nagavalli', the ghostly character in the film." In a statement by eBay, the articles made available for bidding were Rajinikanth's blue shirt worn in the song "Devuda Devuda", Jyothika's saree worn for the climax scenes, the peach-coloured saree worn by Nayantara in the song "Konja Neram", and the Vettaiyan Raja costume and ornaments worn on set by Rajinikanth. Rajinikanth's dress, which he wore in "Devuda Devuda", was sold for ₹ 25,000 (US$554 in 2005). [a] His Vettaiyan costume and ornament set were sold for ₹ 32,000 (US$709 in 2005). [a] The saree worn by Nayantara in the song "Kokku Para Para" was also auctioned. Some scenes, dialogues and expressions from the film, such as the "Lakka Lakka..." sound that Rajnikanth's character makes, became very popular, especially with children. Vadivelu's expressions and scenes—especially those with Rajinikanth—and dialogues including "Maapu...Vachittandaa Aapu!!! ", which means "Son-in-law...he has trapped me!!! ", also became popular. A dialogue spoken by Rajinikanth to Prabhu, Naan gunda irundha nalla irukkadhu...nee elachcha nalla irukkadhu, which translates into "I won't look good if I put on weight...but you won't look good if you have reduced weight" evoked a lot of laughter among audiences. Prabhu's dialogue, "Enna kodumai Saravanan idhu? ", which means "What atrocity is this, Saravanan?" became popular. It is usually used to express irony or surprise. The line was often parodied by actor Premgi Amaren, who altered it slightly to "Enna Kodumai, Sir Idhu?". This altered line was frequently used in Chennai 600028 (2007), Goa (2010) and Mankatha (2011). Prabhu said in an interview with Malathi Rangarajan of The Hindu, "I hope I get to play light roles. Incidentally, I quite like the way in which these young actors have made a joke of my serious line in Chandramukhi—'Enna Kodumai Saravana Idhu' ". Chandramukhi was parodied in various films. In a comedy scene from Englishkaran (2005), Theeppori Thirumugam (Vadivelu) invents an idea to frighten Thamizharasu (Sathyaraj) but the ruse backfires on him as he witnesses Thamizharasu in a garb similar to that of Chandramukhi's. Chandramukhi was parodied along with Anniyan in the Telugu film Rajababu (2006). In a scene from Thalaimagan (2006), Erimalai (Vadivelu), after entering an old abandoned bungalow, gets frightened when he hears the "Lakka Lakka" sound, and says Yaaro Telugula Koopuddrangga! (English: "Someone is calling in Telugu!"). In Vallavan (2006), Vallavan (Silambarasan) is seen singing "Konja Neram" to Swapna (Nayantara). In Sivaji (2007), Thamizhselvi (Shriya Saran) would be seen dancing for the song "Raa Raa", Sivaji (Rajinikanth) and Arivu (Vivek) are seen uttering the last lines of the song. Livingston who appears as a police inspector, utters the sound "Lakka Lakka" which Rajinikanth makes in Chandramukhi. Rajinikanth and Nayantara's characters act in a film titled Chandramukhi 2 in a scene from Kuselan (2008), which P. Vasu also directed. In Thamizh Padam (2010). Shiva (Shiva) would be seen imitating the film's introduction scene by stretching his leg when it is revealed that Siva has a split seam in his pants. Sundar C.'s role in the film Aranmanai (2014) was inspired by Rajinikanth's role in Chandramukhi. Chandramukhi was parodied in the Star Vijay comedy series Lollu Sabha, in an episode named Sappamookki. Chandramukhi was dubbed in Telugu and was simultaneously released with the same title as the Tamil version. It was also dubbed and released in Bhojpuri under the title Chandramukhi Ke Hunkaar. It is the first Tamil film to be dubbed into German. It was released in Germany under the title, Der Geisterjäger (English: The Ghost Hunters). The film was also dubbed and released in Turkish. Despite the release of Bhool Bhulaiyaa (2007), Chandramukhi was dubbed in Hindi and released on 29 February 2008 by Dilip Dhanwani, owner of the production house Royal Film Company. The Hindi version was released in collaboration with producer A. M. Rathnam. Below is a character map of the lead characters in the story of Manichithrathazhu and its remakes. A stand-alone sequel to Chandramukhi titled Nagavalli was made in Telugu. The sequel was also directed by P. Vasu and starred Daggubati Venkatesh as the male lead, and Anushka Shetty, Richa Gangopadhyay, Shraddha Das, Poonam Kaur, and Kamalinee Mukherjee as the female leads. It was released on 16 December 2010. ^ a b c d e f g h i j k l m n o p q r s t u The exchange rate in 2005 was 45.3 Indian rupees (₹) per 1 US dollar (US$). ^ Krishnakumar is Binny's husband and also a professional Carnatic musician. ^ a b "Chandramukhi Blu-ray". Blu-ray.com. Archived from the original on 25 September 2014. Retrieved 4 August 2012. ^ a b c Ram, Arun (20 June 2005). "Return of the king". India Today. Archived from the original on 25 September 2014. Retrieved 22 September 2014. ^ "Cast and Crew". Oneindia Entertainment. Archived from the original on 30 September 2014. Retrieved 30 September 2014. ^ Vijayasarathy R. J. (13 June 2007). "Meet the bus driver Rajni worked with". Rediff. Archived from the original on 6 November 2014. Retrieved 6 November 2014. ^ Kumar, S. R. Ashok (14 June 2005). "Rajni's gesture". The Hindu. Archived from the original on 23 December 2014. Retrieved 23 December 2014. ^ Warrier, Shobha (13 October 2004). "'It will be a stylish Rajni film'". Rediff. Archived from the original on 24 September 2014. Retrieved 24 September 2014. ^ Ram, Arun (25 October 2004). "Remake ripples". India Today. Archived from the original on 5 January 2017. Retrieved 5 January 2017. ^ a b Chinnarayana 2015, p. 11. ^ a b c Kumar, S. R. Ashok (27 September 2004). "The making of a Rajnikant-starrer". The Hindu. Archived from the original on 24 September 2014. Retrieved 24 September 2014. ^ a b c Pillai, Sreedhar (3 June 2005). "Back with a bang !". The Hindu. Archived from the original on 22 September 2014. Retrieved 26 September 2014. ^ Jeshi, K. (11 February 2006). "In an imperfect world". The Hindu. Archived from the original on 27 September 2014. Retrieved 27 September 2014. ^ a b c Warrier, Shobha (20 April 2005). "'Any set you erect should have life in it'". Rediff. Archived from the original on 28 September 2014. Retrieved 28 September 2014. ^ "Cruising through fashion with Sidney Sladen". Rediff. 16 December 2009. Archived from the original on 19 November 2014. Retrieved 19 November 2014. ^ Warrier, Shobha (12 April 2005). "'Rajni was nervous about how he'd look'". Rediff. Archived from the original on 26 September 2014. Retrieved 26 September 2014. ^ a b Warrier, Shobha (13 April 2005). "Vasu on the three most-talked about films!". Rediff. Archived from the original on 26 September 2014. Retrieved 26 September 2014. ^ Rangarajan, Malathi (28 January 2005). "The Prabhu magic always works". The Hindu. Archived from the original on 23 September 2014. Retrieved 27 September 2014. ^ a b "Simran sacked from `Chandramukhi`?". Sify. 17 November 2004. Archived from the original on 25 September 2014. Retrieved 14 October 2011. ^ "Ash says 'No' to Chandramukhi again!". Behindwoods. 4 July 2006. Archived from the original on 26 October 2014. Retrieved 26 October 2014. ^ Reddy, Y. Maheswara (28 July 2010). "Sadha and her missed chances". The New Indian Express. Archived from the original on 20 December 2014. Retrieved 20 December 2014. ^ "Jo is the new `Chandramukhi`". Sify. 18 November 2004. Archived from the original on 25 September 2014. Retrieved 14 October 2011. ^ Kumar, S. R. Ashok (27 May 2005). "'I was lucky to get it'". The Hindu. Archived from the original on 29 September 2014. Retrieved 29 September 2014. ^ Kumar, S. R. Ashok (10 November 2005). "Devar Magan a turning point in my career". The Hindu. Archived from the original on 28 September 2014. Retrieved 28 September 2014. ^ "Sheela in 'Chandramukhi'!". Sify. 19 October 2004. Archived from the original on 25 September 2014. Retrieved 14 October 2011. ^ "'Chandramukhi' launched!". Sify. 24 October 2004. Archived from the original on 25 September 2014. Retrieved 14 October 2011. ^ "'Chandramukhi' starts rolling!". Sify. 26 October 2004. Archived from the original on 24 September 2014. Retrieved 14 October 2011. ^ "Chandramukhi-Fast progressing". Sify. 14 February 2005. Archived from the original on 24 September 2014. Retrieved 14 October 2011. ^ Ramachandran 2014, p. 205. ^ a b "Rajnikanth in Turkey!". Sify. 25 February 2005. Archived from the original on 26 October 2014. Retrieved 14 October 2011. ^ a b Kumar, S. R. Ashok (11 March 2005). "Chandramukhi in Istanbul". The Hindu. Archived from the original on 24 September 2014. Retrieved 25 September 2014. ^ ""I am 100 percent satisfied": Kala Master". Sify. Archived from the original on 25 September 2014. Retrieved 25 September 2014. ^ Vasu, P. (director) (2005). Chandramukhi (motion picture). Sivaji Productions. Event occurs during the end credits. ^ "Chandramukhi (2005) Soundtrack". Music India Online. Archived from the original on 25 September 2014. Retrieved 25 September 2014. ^ Mani, Charulatha (8 November 2013). "Of love and longing". The Hindu. Archived from the original on 24 September 2014. Retrieved 24 September 2014. ^ Pillai, Sreedhar (28 February 2005). "Asha again". The Hindu. Archived from the original on 23 September 2014. Retrieved 24 September 2014. ^ a b "'Chandramukhi' audio fetches Rs 1.10 Crore!". Sify. 17 February 2005. Archived from the original on 24 September 2014. Retrieved 24 September 2014. ^ "U.S. Dollar Vs. Indian Rupee Exchange Rate". USA Today. Archived from the original on 26 October 2014. Retrieved 26 October 2014. ^ a b c "First peek- 'Chandramukhi' audio!". Sify. 4 March 2005. Archived from the original on 26 October 2014. Retrieved 26 October 2014. ^ "'Chandramukhi' audio launched!". Sify. 6 March 2005. Archived from the original on 25 May 2016. Retrieved 25 May 2016. ^ "Brand Rajni shines!". Sify. 7 March 2005. Archived from the original on 26 September 2014. Retrieved 26 September 2014. ^ "Collector's item!". Sify. 27 September 2005. Archived from the original on 23 September 2014. Retrieved 23 September 2014. ^ "Another feather in the Chandramukhi cap". Behindwoods. 28 September 2005. Archived from the original on 23 September 2015. Retrieved 27 September 2014. ^ "Chandramukhi: Rajni fans will love it!". Rediff. 9 March 2005. Archived from the original on 24 September 2014. Retrieved 24 September 2014. ^ Mani, Charulatha (26 October 2012). "Six-note splendour". The Hindu. Archived from the original on 6 October 2014. Retrieved 6 October 2014. ^ "Chandramukhi (Original Motion Picture Soundtrack) - Tamil version". iTunes. Archived from the original on 5 September 2014. Retrieved 25 September 2014. ^ "Chandramukhi (Original Motion Picture Soundtrack) - Telugu version". iTunes. Archived from the original on 26 November 2014. Retrieved 25 September 2014. ^ a b "Legend in the making!". Sify. 16 March 2007. Archived from the original on 27 July 2016. Retrieved 27 July 2016. ^ "Kollywood to spin magic overseas". Rediff. 12 April 2005. Archived from the original on 26 September 2014. Retrieved 26 September 2014. ^ Pillai, Sreedhar (30 December 2005). "Tamil cinema's new high". The Hindu. Archived from the original on 4 October 2014. Retrieved 4 October 2014. ^ a b "Tata Tele, Sivaji Productions in mutual promotion deal". The Hindu. 7 February 2005. Archived from the original on 24 September 2014. Retrieved 24 September 2014. ^ Kamath, Sudhish (9 February 2005). "Get ready for Rajini's flick". The Hindu. Archived from the original on 23 September 2014. Retrieved 23 September 2014. ^ a b Kumar, S. R. Ashok (11 April 2005). "Fans snap up tickets for blockbusters". The Hindu. Archived from the original on 27 September 2014. Retrieved 27 September 2014. ^ "'Chandramukhi' —First sale!". Sify. 20 November 2004. Archived from the original on 26 October 2014. Retrieved 26 October 2014. ^ "'Chandramukhi' for Tokyo festival!". Sify. 29 September 2005. Archived from the original on 27 September 2014. Retrieved 27 September 2014. ^ Venkatesan, Karthick (29 September 2005). "Chandramukhi in Japan". Behindwoods. Archived from the original on 27 September 2014. Retrieved 27 September 2014. ^ "Chandramukhi to open IIFA film festival in Dubai". The Hindu. 14 June 2006. Archived from the original on 26 September 2014. Retrieved 26 September 2014. ^ Lakshmi, K. (4 October 2011). "Taste of Sivaji magic for Russian film buffs". The Hindu. Archived from the original on 11 October 2014. Retrieved 11 October 2014. ^ "Rajini's Chandramukhi again faces an issue". Behindwoods. 20 March 2006. Archived from the original on 25 September 2014. Retrieved 4 August 2012. ^ "Controversy dogs Rajni's Chandramukhi". Sify. 29 November 2004. Archived from the original on 25 May 2016. Retrieved 25 May 2016. ^ "Chandramukhi Blu-ray forum". Blu-ray.com. Archived from the original on 25 September 2014. Retrieved 4 August 2012. ^ Rangarajan, Malathi (22 April 2005). "The Superstar strikes in style". The Hindu. Archived from the original on 27 September 2014. Retrieved 27 September 2014. ^ Kamath, Sudhish (15 April 2005). "Return of the king". The Hindu. Archived from the original on 27 September 2014. Retrieved 27 September 2014. ^ "Rajni-saar rules, ok". The Times of India. 22 May 2005. Archived from the original on 29 September 2014. Retrieved 29 September 2014. ^ Ulaganathan G. (17 April 2005). "Chandramukhi". Deccan Herald. Archived from the original on 29 September 2014. Retrieved 29 September 2014. ^ "சினிமா விமர்சனம்: சந்திரமுகி" [Movie Review: Chandramukhi]. Ananda Vikatan (in Tamil). April 2005. ^ "Chandramukhi". Sify. Archived from the original on 25 September 2014. Retrieved 4 August 2012. ^ Nadar, A. Ganesh (14 April 2005). "Chandramukhi is a certain hit!". Rediff. Archived from the original on 25 September 2014. Retrieved 4 August 2012. ^ Gangadhar V. (1 May 2005). "Southern splendour". The Tribune. Archived from the original on 26 October 2014. Retrieved 26 October 2014. ^ Rukmanykanthan, Karthiga (1 June 2005). "Chandramukhi: Highly entertaining film on split personality". Daily News Sri Lanka. Archived from the original on 25 September 2014. Retrieved 25 September 2014. ^ Hendrix, Grady (27 September 2010). "SUPERSTAR Rajinikanth! - The biggest movie star you've probably never heard of". Slate. Archived from the original on 28 March 2015. Retrieved 28 March 2015. ^ Subramanian, Lakshmi (9 July 2007). "The Boss". India Today. Archived from the original on 4 January 2015. Retrieved 4 January 2015. ^ "Chandramukhi 365th day celebrations at Shanthi Theatre!!". Behindwoods. 9 April 2006. Archived from the original on 27 September 2014. Retrieved 27 September 2014. ^ "Record run of 'Chandramukhi' to be celebrated on Monday". Daily News and Analysis, India Edition. 25 June 2007. Archived from the original on 27 September 2014. Retrieved 27 September 2014. ^ "Chandramukhi- 804 days!". Sify. Archived from the original on 27 September 2014. Retrieved 27 September 2014. ^ "Rajini and Kamal — never to act together again". Behindwoods. 26 June 2007. Archived from the original on 27 September 2014. Retrieved 27 September 2014. ^ "Karunanidhi honours Rajinikanth". The Hindu. 28 June 2007. Archived from the original on 27 September 2014. Retrieved 27 September 2014. ^ "Chennai weekend box-office (April 22–24)". Sify. 27 April 2005. Archived from the original on 27 September 2014. Retrieved 27 September 2014. ^ "Chandramukhi' tops Telugu charts". IANS. 22 April 2005. Archived from the original on 27 September 2014. Retrieved 27 September 2014. ^ "How big is 'Chandramukhi'?Part-2". Sify. 3 May 2005. Archived from the original on 27 September 2014. Retrieved 27 September 2014. ^ "Rajni-The highest paid Indian actor?". Sify. 20 April 2005. Archived from the original on 27 September 2014. Retrieved 27 September 2014. ^ "'Chandramukhi' trounces 'Chandrolsavam'!". Sify. 20 April 2005. Archived from the original on 26 October 2014. Retrieved 26 October 2014. ^ Thangavelu, Dharani (1 July 2016). "Rajinikanth's track-record at the box office". Mint. Archived from the original on 27 July 2016. Retrieved 27 July 2016. ^ a b Gopalan, Krishna (29 July 2007). "The boss, no doubt". Business Today. Archived from the original on 6 June 2014. Retrieved 25 September 2014. ^ Raghu, Sunita (4 May 2014). "Setting the cash registers ringing". The New Indian Express. Archived from the original on 23 November 2014. Retrieved 23 November 2014. ^ "Chandramukhi sets his sights higher". The Nation. Sri Lanka. 19 August 2007. Archived from the original on 27 July 2016. Retrieved 27 July 2016. ^ "Magadheera 1000 day's poster". The Times of India. 28 May 2012. Archived from the original on 12 November 2014. Retrieved 20 November 2014. ^ Velayutham, Selvaraj (2008). Tamil cinema: the cultural politics of India's other film industry. Routledge. p. 199. ISBN 978-0-415-39680-6. ^ Kumar, S. R. Ashok (5 August 2005). "'Chandramukhi' in S.A." The Hindu. Archived from the original on 23 September 2014. Retrieved 27 September 2014. ^ "The final verdict". Sify. 8 May 2005. Archived from the original on 27 September 2014. Retrieved 27 September 2014. ^ "Chandramukhi :Top 10 Films in 2005 (Malaysia)". Blogspot.com. 14 August 2006. Archived from the original on 27 September 2014. Retrieved 27 September 2014. ^ Trivandrum Krishnakumar and Binni Krishnakumar (PDF). Archived from the original (PDF) on 24 September 2014. Retrieved 24 September 2014. ^ Kumar, P. K. Ajith (1 June 2007). "Harmonious duet". The Hindu. Archived from the original on 24 September 2014. Retrieved 24 September 2014. ^ "Anniyan sweeps Filmfare Awards!". Sify. 10 September 2006. Archived from the original on 26 September 2014. Retrieved 19 April 2014. ^ "Film awards announced; Rajini, Kamal chosen best actors". The Hindu. 7 September 2007. Archived from the original on 26 September 2014. Retrieved 19 April 2014. ^ Naresh. "Rajnikant, Kamal Haasan adjudged Best Actors". Screen. Retrieved 5 June 2018. ^ "Kalaimamani Awards for 123 persons announced". The Hindu. 15 February 2006. Archived from the original on 28 September 2014. Retrieved 28 September 2014. ^ "Kalaimamani awards for 123 artists". The Hindu. 26 February 2006. Archived from the original on 28 September 2014. Retrieved 28 September 2014. ^ The Chandramukhi Syndrome: The truth behind multiple personality disorders (PDF). Archived from the original (PDF) on 27 September 2014. Retrieved 27 September 2014. ^ "Fear is the key". The Hindu. 20 September 2008. Archived from the original on 29 September 2014. Retrieved 26 September 2014. ^ "Aranmanai follows Chandramukhi and Kanchana". Behindwoods. 22 September 2014. Archived from the original on 10 May 2015. Retrieved 10 May 2015. Jeshi, K. (8 May 2015). "The funny thing about horror". The Hindu. Archived from the original on 10 May 2015. Retrieved 10 May 2015. Srinivasan, Sudhir (16 January 2015). "Darling: A familiar ghost serves as humour fodder, again". The Hindu. Archived from the original on 10 May 2015. Retrieved 10 May 2015. Sundaram, Nandhu (15 April 2018). "From Kalaignan to Chandramukhi, charting movies released on Vishu and the break in tradition with no releases this year". Firstpost. Archived from the original on 2 September 2018. Retrieved 2 September 2018. ^ "Seminar on psychiatric disorders". The Hindu. 19 August 2005. Archived from the original on 30 August 2014. Retrieved 19 April 2014. ^ "Auction of 'Chandramukhi' memorabilia". The Hindu. 10 September 2005. Archived from the original on 26 September 2014. Retrieved 26 September 2014. ^ Kumar, S. R. Ashok (11 September 2005). "'Chandramukhi' sunglasses sold for Rs.25,000". The Hindu. Archived from the original on 26 September 2014. Retrieved 26 September 2014. ^ "eBay India announces special Chandramukhi auctions". eBay. 12 September 2005. Archived from the original on 24 August 2011. Retrieved 26 September 2014. ^ "Rajini's Chandramukhi accessories fetch a handsome for charity". Behindwoods. 24 September 2005. Archived from the original on 27 September 2014. Retrieved 27 September 2014. ^ a b "Toeing the comic line". The Times of India. 31 August 2011. Archived from the original on 26 September 2014. Retrieved 26 September 2014. ^ Ramachandran, Naman (2012). Rajinikanth 12.12.12: A Birthday Special. Kasturi & Sons Ltd. p. 36. GGKEY:A78L0XB1B0X. ^ "From Dhanush to Silambarasam to Bala: none are spared". Behindwoods. 9 October 2009. Archived from the original on 26 September 2014. Retrieved 26 September 2014. ^ Rangarajan, Malathi (12 September 2008). "On a different turf". The Hindu. Archived from the original on 26 September 2014. Retrieved 26 September 2014. ^ Englishkaran (Motion picture). India: 7 Hills Film Factory. Scene from 57:33 to 59:31. ^ "Another slow and boring family drama". The Hindu. 25 February 2006. Archived from the original on 2 February 2015. Retrieved 2 February 2015. ^ Thalaimagan (Motion picture). India: Radaan Mediaworks. Scene from 36:05 to 36:12. ^ Vallavan (Motion picture). India: Raj Lakshmi Films. Scene from 1:13:00 to 1:13:12. ^ Sivaji The Boss Tamil (சிவாஜி) – Full Movie 1080p HD (Motion picture). India: AVM Productions. 29 November 2013. Retrieved 26 April 2015. Scene from 31:11 to 32:15. ^ Srinivasan, Pavithra (1 August 2008). "Rajnikanth's show all the way". Rediff. Archived from the original on 28 September 2014. Retrieved 28 September 2014. ^ Thamizh Padam (Motion picture). India: Cloud Nine Movies. Y NOT Studios. Scene from 10:20 to 10:55. ^ Suganth M. (19 September 2014). "Aranmanai". The Times of India. Archived from the original on 28 October 2014. Retrieved 28 October 2014. ^ "Chandramukhi Lollu". YouTube. STAR Vijay. 26 September 2012. Retrieved 28 December 2014. ^ Ramachandran 2014, p. 206. ^ Hendrix, Gary (27 September 2010). "Rajni's 'Chandramukhi' in Turkish and German". Slate. Archived from the original on 18 December 2016. Retrieved 18 December 2016. ^ "Return of Rajinikanth". Hindustan Times. 22 February 2012. Archived from the original on 25 September 2014. Retrieved 22 September 2014. ^ "Chandramukhi dubbed in Hindi". Oneindia Entertainment. 29 February 2008. Archived from the original on 22 September 2014. Retrieved 22 September 2014. ^ "'Nagavalli' not a great remake (Telugu Film Review)". Sify. IANS. 18 December 2010. Archived from the original on 27 September 2014. Retrieved 27 September 2014. Chinnarayana, Pulagam (19 July 2015). చంద్రముఖి [Chandramukhi]. Sakshi (in Telugu). Ramachandran, Naman (2014) . Rajinikanth: The Definitive Biography. Penguin Books Limited. ISBN 978-81-8475-796-5.